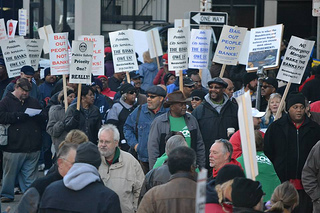 People took the streets in front of the federal courthouse in downtown Detroit during the first day of a bankruptcy trial. A photo by Pan-African News Wire File Photos on Flickr. Why didn’t Judge Rhodes just throw out this obscene proposal to take $350 million from Barclays, another corrupt bank involved in the Libor scandal, to pay off the 2005 swap deal without even examining its legality. By telling them to go and renegotiate another deal is providing a way out for Jones Day who are fraudulently representing the City of Detroit against the will of the people. By adjourning the trial it prevented a former Goldman Sachs executive from providing expert witness testimony exposing the swaps and the negative impact they have had in Detroit and within municipalities throughout the country since 2009. Snyder through his operative Orr is working on behalf of the banks to pay them whatever they want from the taxpayers of Detroit. This whole emergency management and bankruptcy process is nothing but a way to further loot the city. Jones Day is given a blank check to run up tens of millions of dollars in consulting and legal fees while lights remain off throughout the city, people are crowded on buses like sardines, streets are in disrepair and the morale of municipal workers is at a all time low. These corporate agents hired by Snyder and Orr who are occupying City Hall have never worked a day in their lives. All they know to do is steal from the people. Taking public money to pay off their banker friends is the height of injustice and criminality. This illustrates that the courts work with the banks and corporations against the people. If there was any semblance of justice the real culprits (the banks and corporations) behind the Detroit crisis would be on trial. PANW Editor’ Note: These two articles below attempt to cover-up the egregious nature of the Barclays deal. Both the Detroit News and Free Press are mere cheerleaders for the banks. The false claims that this deal saves Detroit money is a blatant lie. Also they utilize the same doomsday scenario that was advanced to justify emergency management dictatorship and the forced illegally-filed bankruptcy. Detroit — The city will try to renegotiate a $350 million deal to address concerns raised by a bankruptcy judge Wednesday about whether the agreement is fair to Detroit’s creditors. The concern from U.S. bankruptcy Judge Steven Rhodes abruptly halted a trial to determine whether Detroit can finalize a $350 million agreement to borrow money and untangle a troubled debt deal that some experts believe pushed the city into bankruptcy. Detroit needs the money to bankroll restructuring efforts while the city is in bankruptcy and pay banks to end a pension debt financing arrangement. Rhodes on Wednesday questioned the city’s strategy of claiming memos analyzing the deal were private and subject to attorney-client privilege. The judge’s comment triggered repeated breaks in the trial Wednesday as attorneys for the city and groups objecting to the deal huddled privately to discuss options. The repeated breaks interrupted testimony from Detroit Emergency Manager Kevyn Orr, who spent almost two hours waiting in the witness box. Detroit is under a tight deadline to have Rhodes approve the $350 million deal and close with the investment bank Barclays by Jan. 7. It is possible the dates will be extended and the deal renegotiated. Barclays, which could make as much as $4.4 million from the deal, already has been paid a fee even though the deal is awaiting the judge’s approval. Instead of continuing the trial Thursday, the city’s bankruptcy team will spend the day negotiating with the parties involved in the deal. Rhodes “strongly” encouraged the city to spend the break renegotiating the deal. The city will update Rhodes on Friday morning. Earlier Wednesday, the judge admonished Detroit’s legal team to stop making deals with parties who are holding “a gun” to the city’s head. Rhodes made the statement after questioning city lawyers over a decision to invoke city attorney-client privilege in disclosing memos associated with the deal. “We could not agree with you more,” city bankruptcy attorney Greg Shumaker said. The city’s bankruptcy lawyer said the legal team wants to keep the assessment confidential because Detroit might file a lawsuit over a financing arrangement brokered during former Detroit Mayor Kwame Kilpatrick’s tenure. The deal involves Detroit paying UBS AG and Bank of America a $230 million fee to terminate a Kilpatrick-era financing arrangement. Orr wants to use the remaining $120 million from the loan to pay for upgrading archaic city computer systems and improving public safety services. Orr said the $350 million loan would save Detroit money while in bankruptcy court, avoid costly litigation, stabilize the city’s finances and bankroll “well-needed” improvements to city services. The city is asking Rhodes for permission to pledge casino and income tax revenues toward the $350 million loan that will be used to pay UBS and Bank of America a termination fee on interest rate swaps tied to a $1.44 billion pension debt deal from 2005-06. If Detroit’s $350 million deal goes through, the city could save $1.5 million to $3 million a month in interest payments, according to Ernst & Young consultant Gaurav Malhotra. Insurers of the pension debt and swaps are leading the charge in opposition to the early settlement, arguing the payout will leave them with less money to recover in Detroit’s historic Chapter 9 bankruptcy reorganization. The city’s pension funds also are opposed to the deal. Orr has said the settlement is crucial to his overall plan to shed billions in city debt and free up approximately $170 million in annual casino revenue. Testimony resumed Wednesday morning after state lawyer Steven Howell said the state Emergency Loan Board would meet as early as Friday and could approve the $350 million deal. The attorney faced pointed questions about why the board did not approve the loan before the trial started Tuesday. “Why wasn’t this done before?” Rhodes asked lawyer Howell, who is representing the state Attorney General’s Office. Howell said the loan board — made up of three people appointed by Gov. Rick Snyder — wanted to await the judge’s ruling and present the $350 million loan for approval. “So someone made the decision to potentially risk wasting the court’s time and attorney fees in this case?” the judge asked. “That was not the intention, your honor — to show any disrespect,” Howell said. Rhodes asked if there was any chance the loan board would not approve the $350 million deal. “We do not expect there to be an issue,” Howell said. Judge Steven Rhodes today ordered the city of Detroit to explain the role of Michigan’s Emergency Loan Board in approving a crucial bankruptcy financing deal, saying he’s not prepared to sign off unless the city can explain why the board hasn’t taken action on the proposal. There’s just one problem: The city’s bankruptcy attorneys couldn’t even remember who serves on the board, which hired emergency manager Kevyn Orr and is overseeing the city’s financial restructuring. Rhodes today pressed Jones Day lawyers — who are representing the city in court — to explain the role of the Emergency Loan Board in approving a $350-million Barclays debt deal the city is seeking. The attorneys — Corinne Ball, Robert Hamilton, Brad Erens, Geoff Irwin, Geoff Stewart and Thomas Cullen — could not identify all three members of the board, who are appointed by Gov. Rick Snyder. The only name they could come up with was former Michigan Treasurer Andy Dillon. Erens said he was not sure whether Dillon is still the state’s active treasurer. He’s not. His resignation was effective Nov. 1 and Kevin Clinton is the new treasurer. But the attorneys believe Dillon is still on the Emergency Loan Board. Rhodes ordered Jones Day to explain the board’s role in approving the financing, when it plans to act and who serves on the board. “I want a report tomorrow morning,” Rhodes said at about 4:15 p.m. today. His comments came on the first day of a trial to decide whether to approve the Barclays deal and a proposed settlement of the city’s disastrous pension debt interest-rate transaction, called “swaps,” with Bank of America and UBS. The city has argued that the financing will help it pay off the swaps at a discount and invest in improved services. Rhodes paused more than seven hours into the trial to ask whether the Emergency Loan Board could kill the Barclays deal. “If there’s any chance they’re not going to approve this, we’re wasting three days of trial with really expensive lawyers,” Rhodes said. Rhodes wanted to know why the board is waiting to approve the Barclays financing — which the Detroit City Council voted against in a largely symbolic move. The City Council did not offer an alternative to the deal, which the law requires for the state to consider overruling the emergency manager’s proposal. “We have every expectation the Emergency Loan Board will approve the transaction,” Erens said. After the hearing, Orr spokesman Bill Nowling said it wasn’t immediately clear that the loan board’s approval for the swaps deal was required. But he said the state treasurer’s office has been kept up to date on the matter and had signed off on it. Nowling said the city would look into the matter and present a report to Rhodes in the morning. Erens said the fact that Dillon has supported the deal and that Snyder backs the city’s bankruptcy indicate the loan board will approve the deal. Detroit Free Press Staff Writer Matt Helms contributed to this story.